Share these stories and beautiful keepsakes with the children you love! Heroes for Young Readers introduces younger children to the lives of Christian heroes! Whether reading for themselves or being read to, children love the captivating rhyming poems and unforgettable color illustrations of the Heroes for Young Readers series. When Hitler invaded Holland, Corrie ten Boom (1892-1983) and her family risked everything to protect their Jewish neighbors. Corrie's life is a testimony of forgiveness, compassion, and the courage to do what is right. Amy Carmichael's (1867-1951) legacy of rescuing hundreds of women and children, first in Irish slums and then in India, is a stunning reminder of the impact of one person who fears God and nothing else. While working in a cotton mill in Scotland, Mary Slessor (1848-1915) longed to be a missionary. God answered her prayers by calling her to the unreached, often dangerous tribes of Africa's Calabar region. 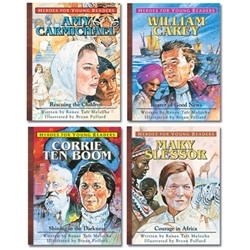 William Carey (1791-1834) dedicated his life to bringing the Good News to people who had never heard it. Leaving his familiar life in England, William sailed to India on a missionary quest. Each book can be purchased individually.